Very nice job on the paint + decals. Nothing wrong with Ford, I like Fords. If anything I would prefer to have a 3/4 ton or higher rated F#50 series, (F250 or higher). Funny: Why dont they make a Dodge shell for the 5T? LOL. I wonder if the 5T chassis can even mount a pick-up truck shell on it. Well I'm not a big ford fan rather have a dodge BUT that is very very nice looking. The body size is a great match for that chassis, nothing looks way to large or small. There is alot of stuff that just doesn't look right as someone else had put it "cartoonish". Very nice! I am a die hard Ford fan and I am lovin what you did. 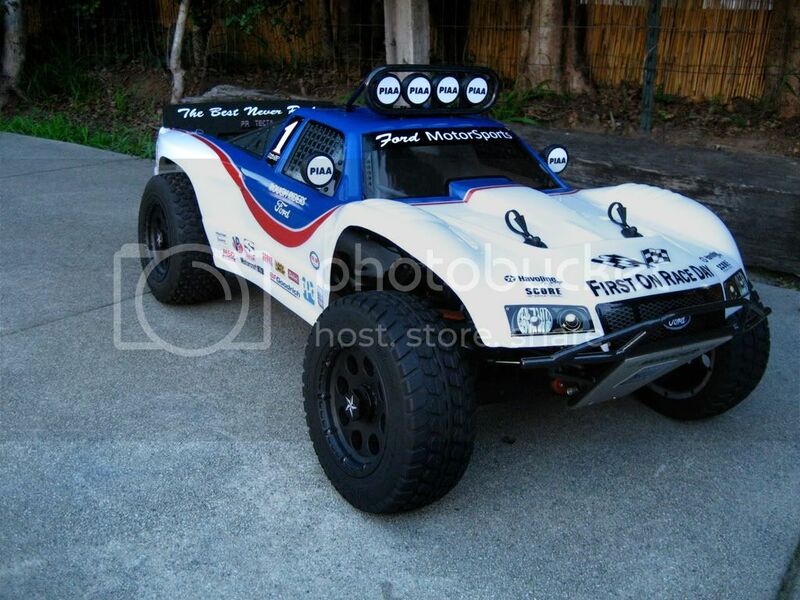 Very nice CraftWerks-RC,the best looking 5T i have seen so far!Maybe i cant call myself a Ford fan by asking this questions(lack of knowledge about US Fords,hehe),but is this the stock Baja 5T body that you have "Forded"? 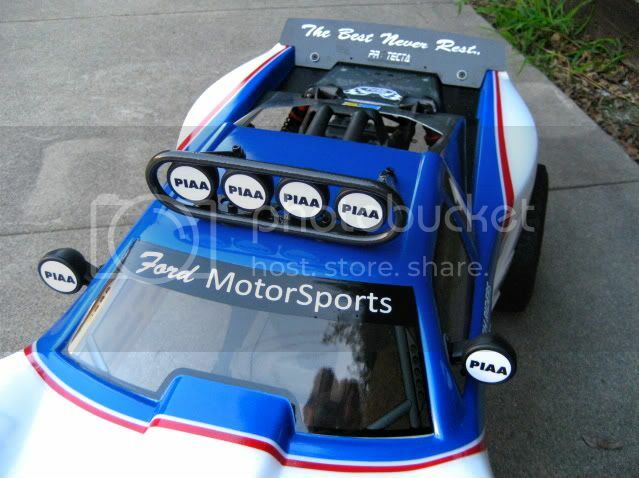 Or is this another body that really is a model of a Ford body and not the HPI-made one? 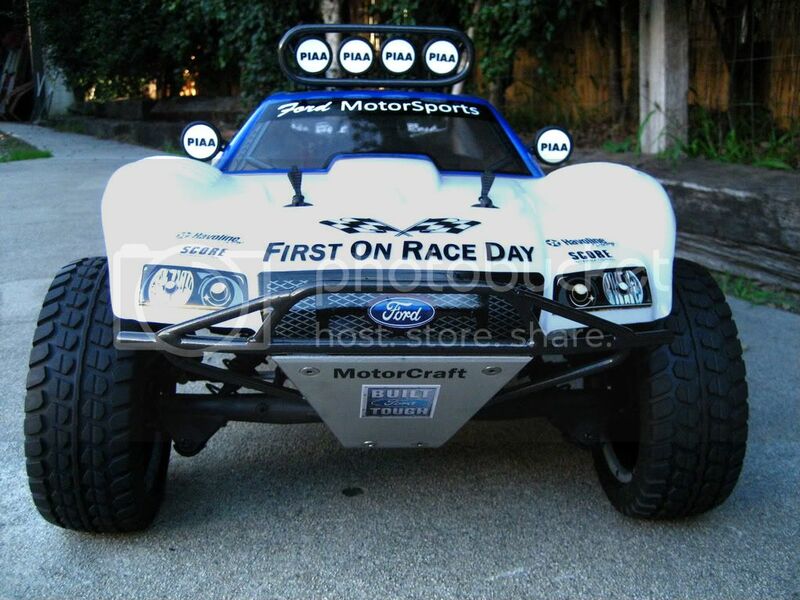 CraftWerks, nice work on the front bumper, more pics please. It take it you made it your self? I just noticed that too. That is not the stopck HPI bumper set. If he made that, that is very good craftsmanship. I only originally noticed the front skid plate, even that by itself shows great fabrication skills. Excellent job, where did you get the light rack? Thanks for all the comments...even from the Ford haters....LOL! Everything was done here in house. From the vinyl/decals and custom paint, to all the fab work. Ah ok, I'm assuming the lights themselves are the stock HPI ones and you made the enclosure? Very nice. Those bodies are so"generic" looking you can probably stick almost any desert racing truck brand on them. Very Nice, makes me want a 5t even more. sick 5t and body! i love the 5t! Now that would be an interesting custom build !!!!!!!!!! I would seriously laugh if somone custom made a 5T into a Ford model T by putting the old model T shell on it and making custom bicycle-like wheels on it!